git plugin 3.9.1 and branch api plugin 2.1.1 is broken. git plugin 3.9.0 and branch api plugin 2.0.21 is ok. The latest updates broke github multibranch builds. These builds should have triggered. Backing out to the last stable set of plugins fixes the problem. Andy Airey for the benefit of others that may refer to this bug report, would you be willing to attach a screenshot of the Bitbucket Branch Source Plugin configuration setting? I realize that this bug report is about the GitHub multibranch, but many readers may find it and assume that Bitbucket and GitHub plugins have the same options and same configurations (which they do not). 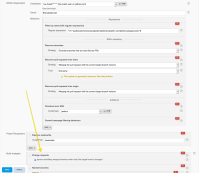 Mark Waite added a comment - 2018-12-12 15:44 Andy Airey for the benefit of others that may refer to this bug report, would you be willing to attach a screenshot of the Bitbucket Branch Source Plugin configuration setting? I realize that this bug report is about the GitHub multibranch, but many readers may find it and assume that Bitbucket and GitHub plugins have the same options and same configurations (which they do not). Sebastien Gagnon did you apply the instructions in the summary of the configuration change that is usually the best way to resolve the issue? 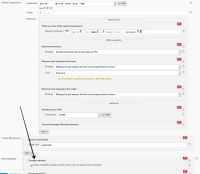 Mark Waite added a comment - 2019-01-27 22:16 Sebastien Gagnon did you apply the instructions in the summary of the configuration change that is usually the best way to resolve the issue? Instead of suggesting that people apply the workaround, having to fix hundreds of thousands of jobs worldwide, how about just reverting the breaking change? I alone have 3570 jobs to inspect and make a code change to because of this error. How do I get back to the point of NOT having to make this change, and simply have the github functionality work as expected? John Mellor added a comment - 2019-01-28 14:08 Instead of suggesting that people apply the workaround, having to fix hundreds of thousands of jobs worldwide, how about just reverting the breaking change? I alone have 3570 jobs to inspect and make a code change to because of this error. How do I get back to the point of NOT having to make this change, and simply have the github functionality work as expected? John Mellor we understand your frustration, but please be more careful with your phrasing, and be respectful of people time here. This is not a customer support channel. Baptiste Mathus added a comment - 2019-01-31 12:51 John Mellor we understand your frustration, but please be more careful with your phrasing, and be respectful of people time here. This is not a customer support channel.